What comes to mind when thinking of St Patrick’s Day? Spring time weather, lucky charms, leprechauns, green colored bagels at the grocery store? 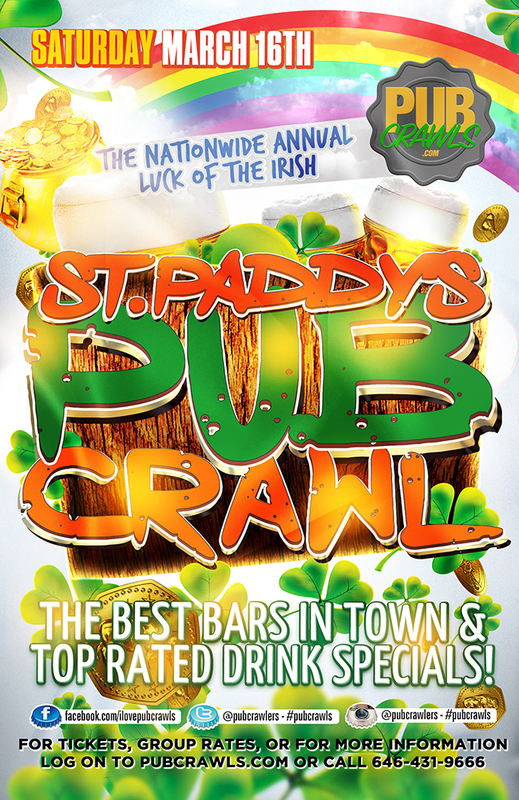 Of course, St Paddy’s is a super festive time and with all the joy surrounding the holiday, what better way to celebrate than a Pub Crawl?! This year’s annual Luck of the Irish Pub Crawl in New Haven is sure to give you an inside scoop of the awesome bar scene in the city. With a bar crawl event, you’ll be able to explore all of the wonders of New Haven while rejoicing in the spirit of Saint Patrick. Green is in the air. There may not be a better time of the year than to join a pub crawl event. With all of the Irish Whiskey Shots available at the participating venues, there will be plenty of Irish cheer to go around. At check-in, all participants will receive a PubCrawls.com branded wristband and fully guided map that will outline all of the specials taking place in New Haven. Take a stroll through the city with your best buds and embrace the spring time St Paddy’s rainbow! Participating venues include Brother Jimmy’s BBQ, JP Dempsey’s, Christy’s Irish Pub, & more!